Studies of astrology are infinite. When you add the Big Bang Theory into your perception of astrology, you will endlessly learn all about all different categories you can imagine; black hole, aliens, nebula, exo-planets, multiverse and other sci-fi topics. Since astrology is my most favorable subject in science class, so I was concentrated during class than ever. I was really excited to learn when my science teacher began speaking the word ‘space’ in the class. More importantly, I was even more excited for the astrology project, where we get to research and present whatever we wanted to learn as long as it is based on astrology. I had a brief trouble picking which topic I should do (because there were so many I wanted to know! ), but in the end, I came up researching about the ‘Super Earth’, which is in my ‘wanted-to-research’ list. The standard presentations like presentation slides, videos were a cliche, so I made a unique visual-presentation using Piktochart. When I first saw the blank chart, I wondered if I can really finish this in time as usual. The start was kind of tricky; after watching the tutorial, I still didn’t get some of the parts such as changing the background image, copy/paste. Especially, I didn’t get the idea of ‘blocks’ in the chart: thinking these makes he background look bad. However, once I started getting accustomed to those new features, I was pretty okay with handling some issues. Moreover, I was enjoying making the Piktocharts! Not only you can literally move fonts, images and other pixels, you can even hyperlink words and it opens to the new link. I was really satisfied with using Piktochart. Now let’s talk about the process of knowing Super Earth. *To viewers who don’t know what Super Earth is, Super Earth is an exo-planet (planet that is not in our solar system) that has the mass larger than Earth, but smaller than Uranus or Neptune. Not all Super Earth are the ‘Second Home Planet’ due to its name of having a word ‘earth’; some of these planets are highly habitable to living creatures, while others are either unconfirmed or not habitable at all. *If you still don’t get it, here is the link that explains what Super Earth simply is. The word ‘Super Earth’ thrilled me thing about learning those new potential possible outer planets, but when I actually researched, I wasn’t really enjoying it. There were so many to research to; exo-planet, habitable zone (zones in a solar system that is appropriate for living creature to survive), Kepler Orbit of Interest (potential habitable exo-planets found by Kepler Telescope), and all those other alien topics I never heard of. The thought of knowing what I wanted to learn so bad is graet, but the process was painful – never forget ‘No pain, no gain’ – or else you don’t really get what you wanted. After I finished researching, I incorporated the facts into Piktochart along with some images. Since the aim for Piktochart is to inform the viewers visually rather than becoming an article, I chuncked up the paragraphs into few sentences and added icons to explain the texts in case for people like me who prefer to ‘read’ the images with less words. This was the most fun part in astronomy project, and I can use Piktochart for next upcoming projects! About a week ago, we have done a Student Led Conference with our parents where we show all the progresses we have done throughout this semester. From all my experience, there are times where parent can have a high-expectation to their children and ask thousands of questions before they can even say a single word about the recent project, on the other hand, there are parents where they are a good listeners in during SLC, but then does a ‘interrogation’ back in home. I thought my parents are going to ask lots of questions like last year, but this year was a surprise. Overall in this SLC, lots of events went well than I predicted. I was concerned about if my parents are going to point out about the short-length paragraph per subjects, but instead of looking at those amounts, they became cool and seem to show interest about what I learned and thoughts about subjects. So with less pressure, I performed enough to satisfy myself. However, the negative side of this year’s SLC was I got some technical errors. When I was about to show the ‘Tienda de Ropa’ Spanish video to my parents, this computer said, ‘Due to unexpected error, this video can not be presented.’ So instead, I explained about what my partner and my role was, what was our objective and some funny blooper moments. Next time, I will double-check my links and url to prevent further technical issues and go over the subjects by practicing over and over until I feel somewhat confident. Why did the rich want art? Because they wanted to show their status and their wealth. What movement began in 1870? The wave of the ‘Impressionism’ have started around the artist in France. What was their purpose/technique used that made them different? The impressionist tries to capture the impressions of that scene of a specific moment of time instead of drawing it very sophisticated realism. Which movement was after Impressionism? Who were 2 artists? There was a post-impressionism, and the famous artist at that era were Gogh, Seurat and other artist represented. 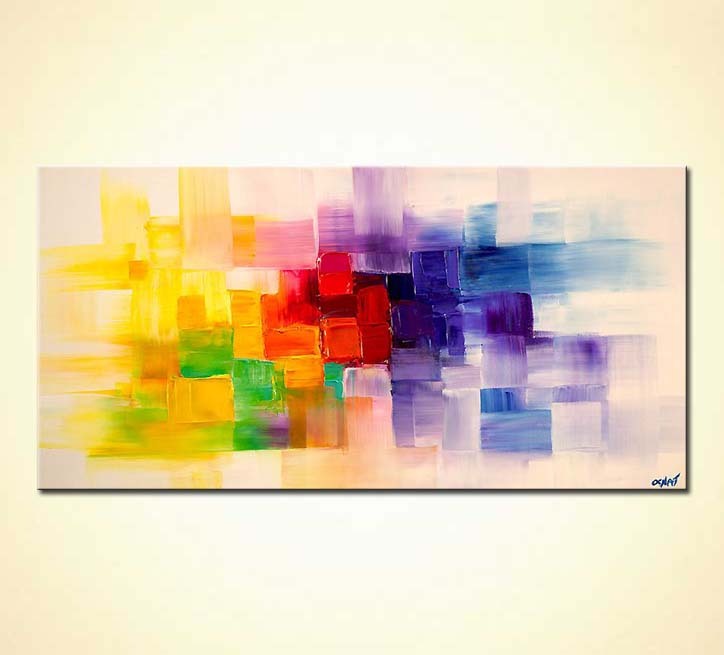 Abstract art has color, line, form, texture in the subject as painting. Abstract art is called non-representational art because…. It doesn’t have a recognizable subjects since the abstract artists are not focusing to make their painting look like an object. How can this type of art generate an emotional response? Because there is no detail, or a recognizable artworks. Is your work Abstract? Why? What emotions do you think your art triggers? I think my art piece triggers coldness, somewhat chic, loneliness, and calmness because most of the colors I used are cool colors, and personally, bright but smooth colors calms me down. What was one thing you learnt from the video? I learned that the Impressionism had originated from France, there was a Post-impressionism between Impressionism and Fauvism. When the class starts social studies, the first thing that pops up to my mind is the CSI. CSI which stands for ‘Color Symbol Image’ is a diagram of explaining the chosen word using the three factors of the CSI. It can be either written or drawn to present the CSI. This time, I chose the word ‘Bobbin Girls’ to represent my Industrial Revolution CSI. For people who are new to learning Industrial Revolution, bobbin girls are young girls who works in a textile mill during the huge revolution in European country. So here are my explanation about the three factors below my CSI. Color: I chose this color to represent the busy and rusty image of metallic factory that the girls work in. Symbol: The chain represents the harsh labor while the meaning of the rose bud means ‘youth’. It’s a youth that have been chained up with labor. Image: There is a girl working on a thread loom machine to clearly show she is one of the bobbin girls in textile mill factory. 1) What did you learn about the design process? We’ve learn that the rubber band model we planned to do didn’t work out after all so we decided to change it into balloon powered vehicle. What would you do differently in the design process? Next time, I would look at various kinds of step-by-step tutorials instead of looking at a single tutorial. I would also make the vehicle small and short in order to increase the distance. 3) What did you learn about Newton’s Laws? I learned lots of massive information since I started off as a person what don’t have any knowledge of Newton’s Law of Motion. One of the part that lasts long in my memory is Newton’s 3rd Law which shows the action and the reaction has the same size when they give an action, but the action and the reaction goes on a opposite direction. What changes would you make to your vehicle? I would change the rubber band powered vehicle into a balloon powered vehicle for its simple machinery and the easy use when releasing to the floor. What would you do to extend the project? What next-steps would you take? What other types of design would you like to experiment with? I would say instead of showing all the three Newton’s Law, choose one of the Newton’s Law and just focus on that law which I will see a simple but very specific vehicle with a straight-forward goal. So far, our group is almost done creating a Newton Vehicle after we discussed what to plan on. Our group decided to make a rubberband-powered vehicle by winding the back pole of the car which the rubberband is hooked to the stick we glued it on the middle of the pole that connects the two wheels. When we unleash the winded vehicle, the unbalanced force that the rubberband is bringing causes the vehicle to change its velocity. It does not require lots of forces to move our vehicle since our vehicle isn’t heavy enough to require lots of efforts. 2) Summarize Newton’s 1st Law in your own words. 3) Summarize Newton’s 2nd Law in your own words. Acceleration is occurred when a force is given. The larger the force is, the greater the acceleration will increase. 4) Summarize Newton’s 3rd Law in your own words. 5) What physics topics do you think will be important to keep in mind as you design your vehicle? Why? Name at least 2 topics – be specific. I think we should keep in track of Newton’s 1st Law and the 3rd Law because our plan to make the rubberband-pulled-back vehicle connected to the definitions towards all of the Laws of Newton. This is the certificate you get once you have mastered all the 2 levels from code.org. *Before starting, sorry to say that mine is not really a narrative. But I got special permission from the teacher. Reader: It’s really interesting of how I can communicate to you guys by just thinking what I want in my head. So…you call that ‘telepathy’ in your kingdom… I have no idea what you are talking about ,but it’s so magical to talk in our mind! Are you a wizard? Alien 1: No, we are just aliens from planet GIgA7463-EK. Reader: Oh my… Are you persuading me to believe that chaotic nonsense? Alien 2: Not really, we just want you to know who we really are even if it may sound like nonsense. Will you believe us? Reader: I’m not sure if you are telling the truth, but I will keep listening to your story since it’s so fascinating. Alien 1: Thanks for your understanding! Reader: Anyway, what brings you to this world? Alien 2: Good question. We were sent to this planet to learn about the religion. Alien 1: Is it true that all the people believed before you were born believed in all united religion? Reader: Not that long time ago. Probably what you meant was the time when my grandma was young. Back in my grandma’s time, almost everyone were Catholic. Reader: Because, Catholicism was a very powerful religion like government in a country. You can also say the pope back then was almost equally strong as the emperor in a country. Alien 2: I see, then if your grandma was a Catholic, how come your parents have changed their religion into Protestantism? Reader: Ummm…Wait a minute, how do you know my parent’s religion? Alien 1: We just tend to know everything about people in this planet, technically. Alien 2: But we won’t say your private events, so don’t worry. Reader: You guys also know my private stories? Alien 2: Anyway, could you go back the story about your parents changing their religion? We are very curious about that. Reader: Fine. It was the time when a monk named Martin Luther thought something was going wrong in the Catholic church after sighting few unwelcoming events that doesn’t abides the Catholic rules . There was an act of selling indulgence, same as selling God’s forgiveness and also they were selling powers and positions! He didn’t like how church was functioning, so he made his rebottled statements which later became the ‘95 theses’. However, the Catholic Church didn’t accept his proposal. So Martin decided to create his own church that followed the bible. He then printed the bible translated into German and wrote hymn, mass and baptism services. That’s how Protestants were created. Alien 2: Now I get the point how Catholic and the Protestants are different, but you haven’t explained why your parents changed the religion. Reader: Well, at first, my parents felt the same way as Martin Luther as they saw some unexpected events that was going on the church. Luckily, my parents are the people who are honest and faithful, so they know the true definition of the religion. It came to the point where my parents couldn’t take it anymore which made my parents to change their religion where people study from the bible instead of obeying pope’s crazy demands. When my parents knew who Martin Luther was, they were relieved to find someone who had a same idea with them and decided to move their religion that was created by someone who understands their perspective. Alien 1: Did your grandma say anything about that? Reader: Well, the thing is…. Changing the religion made the relationship with my grandma worse. No matter how hard my parents persuade my grandma how Catholic Church was not the church that used to be, my grandma wouldn’t believe in them and kept denying my parent’s idea. The conflict got worse and worse until when my parents changed their religion, the contact with my grandma ended. Her signs just disappeared from nowhere after my parents have changed the religion. Probably she was very angry of what my parents have done. Alien 2: Well, I’m sorry to hear that. I hope your grandma is living well. Alien 2: Any thoughts about your parents changing the religion? Reader: Actually, I have same opinion as my parents, which makes me understand why they have changed their religion. I do not like a religion what wasn’t used as a religion, and I think the Protestants does know the real objective of the religion. Alien 2: Are you happy about the decision your parents made? Alien 1: That’s great. Unfortunately, I guess the time is running out for us to stay in this planet. (turning to Alien 2) We better go back to the space shuttle. Alien 2: Okay, we should do that right now. (turning to the reader)Anyway, you have helped us alot today. I’m really grateful of your generosity or spending some time with us. Reader: Wow! It’s like a book with pretty covers with lots of paper with lines! Thank you so much. Alien 1: You’re welcome also. See you some day! *And that was the last sight of those two aliens and the reader. The 7-minute run challenge is a non-stop activity which students can either sprint, jog or walk while they are proceeding the seven minute challenge. The objective to this run is to notify the students the distance they have ran in total 7 minute. We mostly do this activity outdoors and to track how many meters students have run, there are flags that marks each corner of the track. My goal was to get a gold award before the fall break, but in the end, I was about 2 km close to get the gold award. This did not meet my goal for the seven minute run challenge since I haven’t achieved the gold award before the fall break. Overall, it was tiring but I liked the satisfaction I get when I tried very hard in 7 minute challenge run.